Habit: Annual to shrub [tree]. Leaf: cauline, simple, opposite or whorled, often gland-dotted; stipules 0. Inflorescence: cyme, panicle, or flower 1, terminal or axillary. Flower: bisexual, radial; sepals persistent, generally 5, often fused at base, overlapping; petals generally 5, free; stamens generally many, free or +- fused into 3--5 clusters; pistil 1, ovary superior, chambers 1--3, placentas generally axile, style branches 3. Fruit: capsule, generally septicidal. Seed: many, small. Genera In Family: 37 genera, 1610 species: worldwide, largely tropics. Note: Sometimes included in Clusiaceae. Habit: Annual to shrub, glabrous. Leaf: sessile Inflorescence: generally terminal cymes, bracted. Flower: sepals 5; petals 5, deciduous or persistent, generally +- yellow; anthers occasionally black-dotted; ovary chambers 1 or 3(5), placentas 3(5), axile or parietal, projecting into chamber. Habit: Perennial herb from woody caudex, 15--20(30) cm. Stem: many, slender. Leaf: 15--40 mm, linear to lanceolate, not clasping, generally folded, sparsely black-dotted. Inflorescence: flowers generally 3--9 per stem. Flower: sepals 5--9 mm, lanceolate, acute, margin black-dotted; petals 10--15 mm, +- obovate, golden-yellow, margins black-dotted; stamens free or in 3 clusters of 4; styles +- 10 mm, spreading. Fruit: 6--7 mm, 3-lobed. Seed: +- 1.5 mm, dark green-brown. 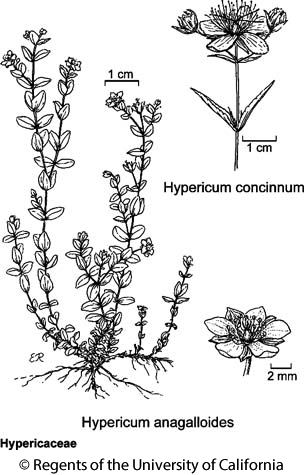 Citation for this treatment: Robert E. Preston & Jennifer Talbot 2012, Hypericum concinnum, in Jepson Flora Project (eds.) Jepson eFlora, http://ucjeps.berkeley.edu/eflora/eflora_display.php?tid=28745, accessed on April 19, 2019.
sw KR, NCoR, CaRF, n&c SN, se ScV, SnFrB. Markers link to CCH specimen records. Yellow markers indicate records that may provide evidence for eFlora range revision or may have georeferencing or identification issues. Purple markers indicate specimens collected from a garden, greenhouse, or other non-wild location.